Located in south Fulton County, Georgia (just outside the towns of Palmetto and Fairburn, 8 miles from the Atlanta airport), Camp Bel-Tel is a 120-acre primitive camp. The camp includes a large lake for fishing and boating, camping areas, nature trails, waterfall, and lots of natural wooded space! Camp Bel-Tel is open to units and groups for overnight primitive camping, daytime activities, and special events. Camp Bel-Tel is managed by the Lawhorn Scouting Base and all registration is handled by the base's business and reservations office. 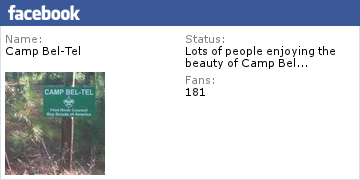 See photos of Camp Bel-Tel here. Scout unit camping and activities are free at Camp Bel-Tel! 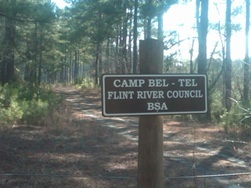 For more information on Camp Bel-Tel, contact the Camping Department at 770-227-4556 or Lawhorn@Scouting.org .